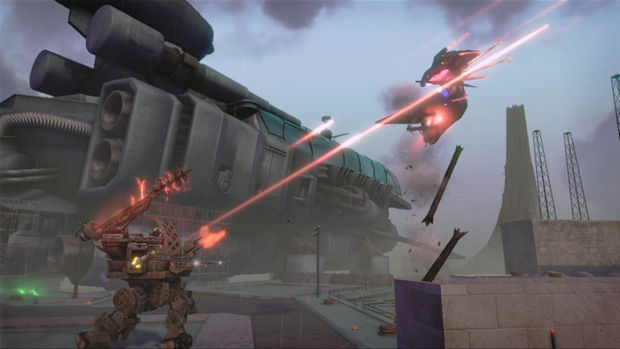 Europeans finally got to play Double Fine's excellent mech-meets-tower defense game Iron Brigade late last year, after a long delay caused by the unfortunate trademark debacle surrounding the initial title -- Trenched -- resulted in the retitled and slightly expanded version. The war between the Vladimir's Monovisions and Woodruff's Trenches is far from over, however, as the battle for the greatest moustache in the solar system rages on in Rise of the Martian Bear. Rise of the Martian Bear picks up right after the Iron Brigade's grand finale in the Pacific theater. Far from being defeated, the nefarious Vladimir Farnsworth has survived by becoming one with the Broadcast. Oh yeah, and he is now using a bear as an avatar by having retrofitted it with tubes, CRT monitors, and a matching beard and moustache. Vlad has spread the Broadcast into space, so it's up to you to launch the USS McKinley -- your mobile base of operations -- into space to track him down. The downloadable content's five campaign missions form a chapter similar to the ones you played in the main game, and similar in length, taking you from Earth to the Moon and finally to Mars. 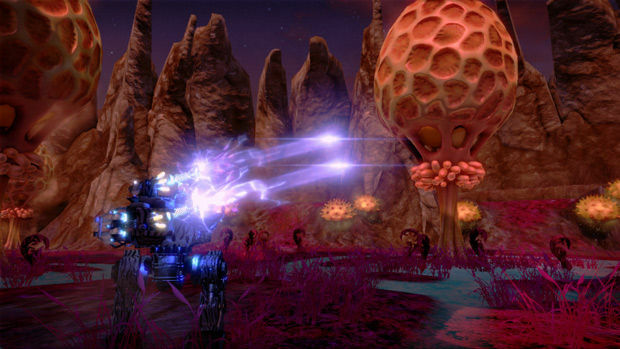 Like the missions found in Iron Brigade, the new missions are meant to be played cooperatively. You can play them solo if you want to, but there's a good chance you'll have a hard time doing so. I hadn't started up the original Trenched after completing it shortly after its American release, and never touched the Survival mode once it was renamed. Suffice it to say it took me a good amount of attempts to even pass the first new mission on my own, until I reached a high enough level to use some of the more advanced new loot. Far from being impossible, the new missions do fall into the "Hard" category of missions that you may have experienced in the Pacific campaign. Some new enemies enter the fray in the form of the aerial Noids with their ranged attacks, the emplacement-hunting Amplifiers, and the miniature swarms of Cathys that try to suicide bomb you. Both the Noids and Cathys attack you in favor of whatever it is you are trying to defend -- as long as your Trench is operational -- but since you can't really die in most of these levels, they are more of a distraction than a real threat. One level also adds a new decoy mechanic, allowing you to turn on two remote tower constructs that attract all Tubes to attack them until they are destroyed by the Monovision threat. While it's an interesting mechanic to throw into the mix, giving you some breathing room in a wave if you've lost some of your emplacements, one of these towers is too far away from the general action to be practical unless you've failed the mission enough times to plan it into your wave strategy. As DLC goes, Rise of the Martian Bear isn't the most innovative piece of downloadable content out there. It does the job by adding new levels and a boss encounter, but nothing about it really screams "fresh." If you were annoyed by the shield-projecting Jacobs in the vanilla game, they are still the primary source of frustration in the DLC missions. I really wish Double Fine had added a way to prioritize targets for your towers, even if it took a special support emplacement to allow one person to do this at the cost of Scrap. A few levels, and the Survival levels in particular, can lead to a bit too many trial-and-error retries when you are trying to prevent your base from receiving any damage from Tubes protected by Jacobs. Even with a team of three, it's all too easy to be a little too late in responding to multiple shielded threats, especially when you have to run up close to deal with the Jacobs as they are obscured from long range manual fire. Having said that, Iron Brigade is still an exceptionally fun game to play with a couple of friends, and the new missions give you a good couple of hours worth of extra content before you acquire gold stars on all of the new levels. In addition, the two extra Survival levels in Rise of the Martian Bear make it very easy to just play a game here and there and unlock some loot in the process. Speaking of which, the new loot provided by the expansion is all pretty good, exotic, and varied enough to encourage going back to the original missions and try out some new tactics with your new weapons, emplacements, and chassis parts. Your enjoyment is going to largely depend on willing co-op partners, as failure in a mission forces you to sit through unskippable in-game cutscenes and one of them has a terrible and inescapable bear pun. Try to finish this mission by yourself while you're underpowered, and it will drive you insane. 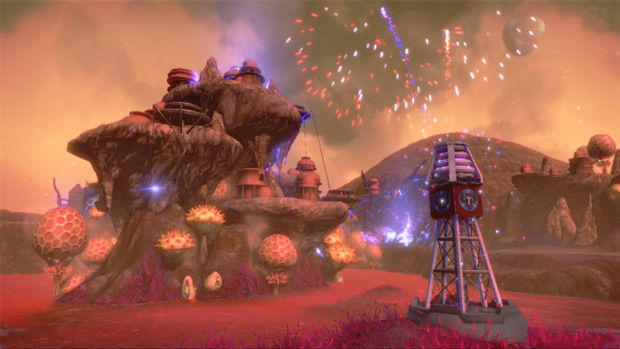 You'll also likely opt to rely on sniper emplacement for most types of enemies if you're playing solo, as the Noids, Volt Droppers, and other aerial enemies that litter the new maps don't seem to suffer that much damage from even your upgraded anti-air turrets. Then again, what boredom and frustration you might encounter by attempting to walk the lonely path is easily remedied by playing with others and by coming up with creative and complementary Trench builds. 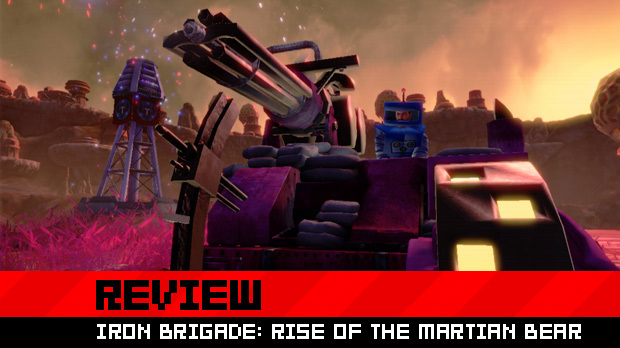 Rise of the Martian Bear simply adds more of the same with some minor additions, but when that means more Iron Brigade goodness at a bargain price, it's hard to argue against it.